Train sets are a hot-ticket item, and there’s no wonder why. Getting to build the tracks their favorite locomotives will then chug along is exhilarating for most kids. And good news for mom and dad: it’s a developmental tool that will help them grow while they play. Train tables can be limiting in terms of world-building, but they do provide parameters that force children to be creative and logical in their problem-solving, as they figure out the best layout for their designated space. If you choose to opt out of a table and let them freestyle it with a train set and the floor. We have recently updated this list of the 10 best to include a couple of new, highly rated products. Additionally, we reviewed all existing product information such as material, construction, dimensions, age ranges, cost and availability, to ensure that all is accurate and up to date. 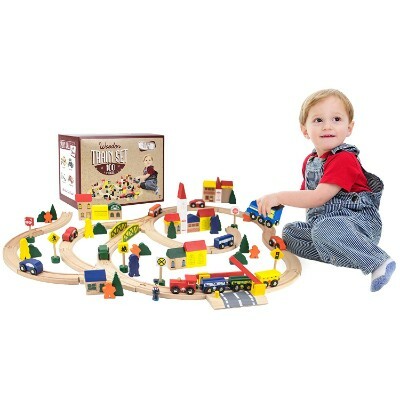 This versatile set is the perfect way to introduce your child to the wonderful world of trains. It comes with everything they need to jump right in, including multiple figurines and accessories that add a realistic element to the play experience. It also boasts an almost five star review and the recognized Amazon’s Choice seal of approval. The pieces require many different connections and variations to work together, which is a great way for your child to enhance their reasoning, judgement, and evaluation thought processes, all of which are a key component of cognitive development. With 100 pieces included in this set, your child has ample opportunities to develop their cognitive thinking through play. With the single piece construction method, there are no loose pegs that can potentially be harmful to your child. It features endless combinations that encourage social, physical and cognitive skills as well as encourages creativity. 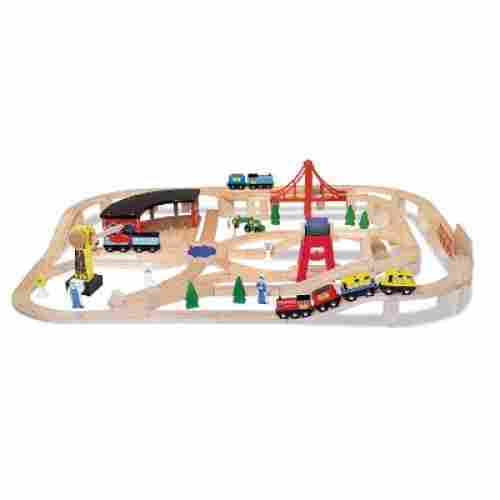 Even better, it’s compatible with the highly popular Thomas &; Friends Railway sets, so your family can enjoy creating the railway of your dreams in the comfort of home. 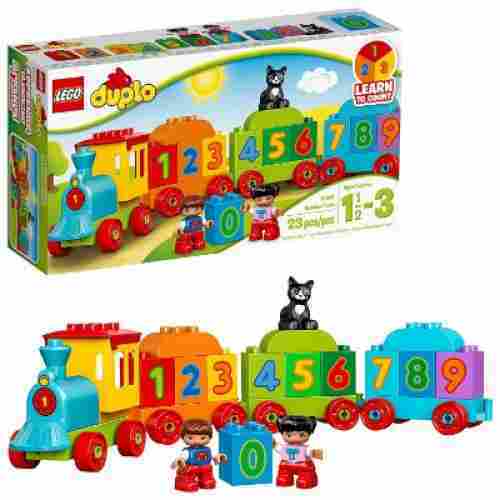 Because the blocks in this set require your child to attach them into a train according to the correct numbers, it’s a great learning experience for your child while having fun. 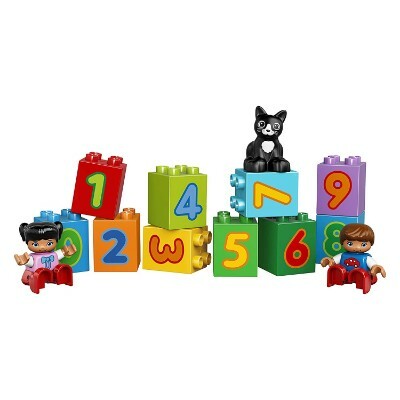 By connecting the blocks in numbered order with your help, they can feel a sense of pride and accomplishment while taking the first steps towards mastering basic counting skills. It’s specially designed to be held and manipulated by small hands, making it the ideal gift for hours of satisfying play. Parents love that this sturdy set stays together once connected, so children can enjoy hours of pushing it around the floor without it falling apart. A total of twenty-three pieces complete the set, so your little one won’t be overwhelmed by too many parts. If you’re looking for a sturdy, durable, and wooden activity table, then look no further than this play table by Melissa and Doug. It creates a defined play area for your kids to use as their designated play area. 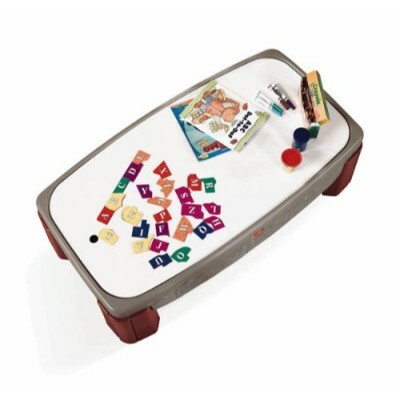 It features a double-sided board that allows for a range of activities. It’s important for kids to have a dedicated space within the home where they can feel free to create, experiment, and play. This table will give your child the space they need to explore their own imaginations while providing a safe and secure surface that you can appreciate. In addition, it also features a jumbo-sized pull out drawer that allows you to conveniently and neatly store away all the supplies and toys. 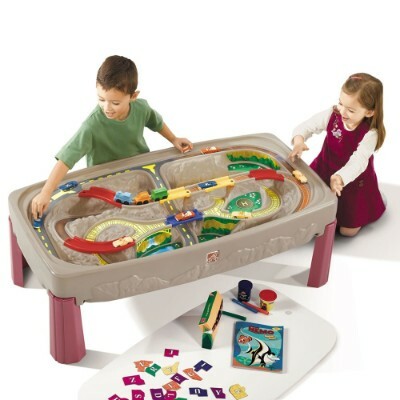 This activity table does just that in a safe and functional way that parents and kids love. It has ample space for everything from train sets to art activities and so much more. With Christmas around the corner, your little one can help bring the goods from Santa’s top-secret location! This remote-control locomotive features a working headlight and three train cars. 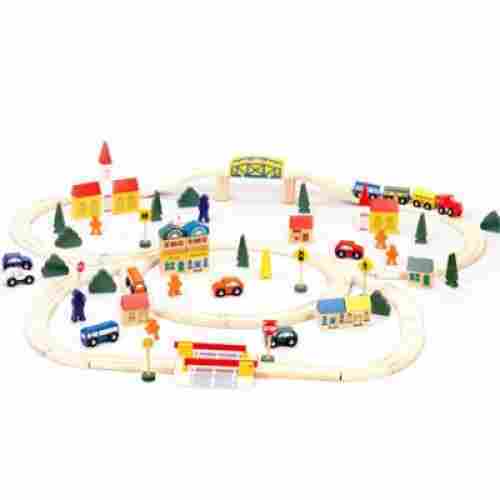 A ready-to-play track contains 24 straight and eight curved track pieces, all plastic. 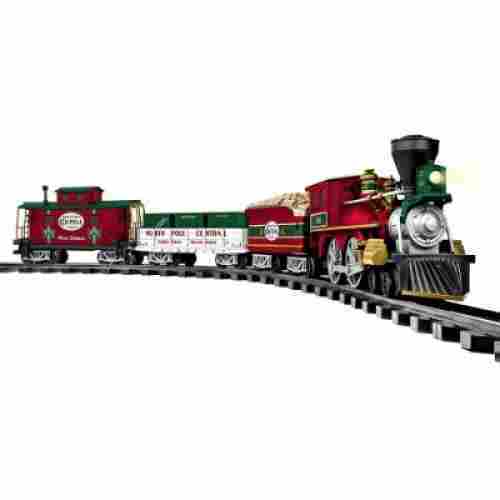 This train set will highlight the spirit of giving, this Christmas season, as your little ones race to help Santa disperse all the year’s presents! 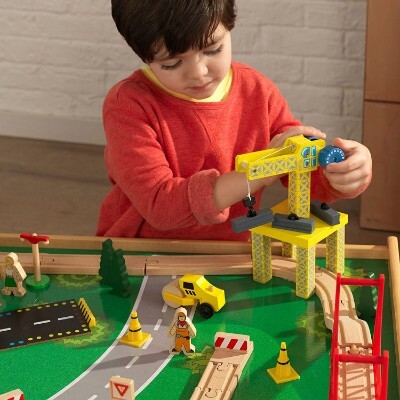 The track is easy to set up, but assembly will enhance motor skills and the set is geared right up for lots of imaginative play. Use the remote button to push the train forward or backward, sound the whistle, ring the bell, and make important announcements. Pack the gondola full of toys for all the good girls and boys, then off you go with a ho, ho, ho! The train is painted in vibrant reds and greens to match the spirit of the season. Pop that Polar Express DVD into the player, set up your train tracks, and play along with your favorite movie characters! This spirited, seasonal favorite is gorgeous. The remote-control train activity will help hook the eyes, ears, and interests of older children who might otherwise find train sets a little boring. Plus, it’s a great accessory to break out while you watch the Polar Express! The set is colored and crafted with lead-free, kid-safe paints. These lead-free paints also ensure the longevity of the product. Your child will be immersed as they figure out the various configurations of this train set. Though not great for use on non-solid or carpeted surfaces, they otherwise are great. The pieces fit snug with each other ensuring no unnecessary collapses. The track also comes with instructions on the four different available configurations. If you’re thinking of a really nifty starter train table package for your youngster, the Deluxe canyon Road Train & Track Table by Step2 is a sure bet. The great thing about this is that it comes as a fully convertible piece; put on the lid and you’ve got a fully functioning activity table for your kids. They can draw, play, and even create other stuff using its large surface area. 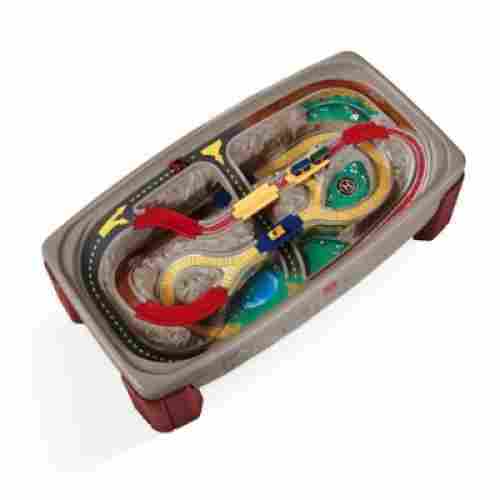 For train fanatics, however, it is the deep canyon design of its main tray that will keep kids entertained for many hours. Unlike the traditional train track sets and tables, the Canyon Road Train Table by Step 2 won’t fall apart as your child plays with it. The table comes complete with recessed parts that allow for plenty of space for storage. Made entirely of high grade vinyl, you can bet this one’s easy to clean, tough against scratches, and will last many years. The play set comes with a 3-unit train set to get your kid started on this wonderful journey. The table’s white laminated wooden top can be converted into a surface that’s great for playdough and Lego surface. The Deluxe Canyon set is unique in that it allows for a 2-in-1 approach to the use of the furniture. At any rate, kids can find versatility in its use, allowing them to harness other areas of their development. 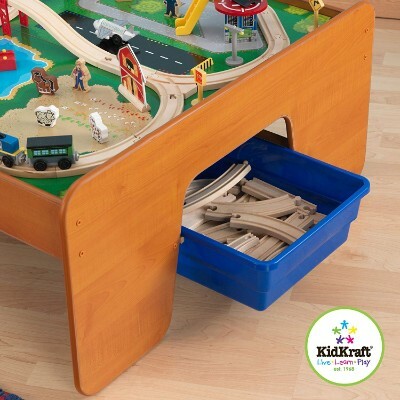 This spacious KidKraft train table is perfectly constructed for train play and storage! The t-molded edges prevent chipping, and a 1.5-inch lip keeps toys from falling off the edge of the table accidentally. The build is durable, and the silk-screened landscape makes for an awesome, imaginative play board. Three red plastic bins fit under the table top for easy storage. Train tables work children’s motor skills, as well as creative problem-solving abilities. This train set is also well-equipped for imaginative play, given all of the fun accessories included. A crane and construction roadblocks will let eager trains know where to stop, and the police can help guide anyone around broken roadways. With 120 total pieces, the possibilities are endless. Build tracks over and under mountain passes, as well as across the bridge. Completely smooth and safe, these wooden toys are built for longevity while also bringing lots of enjoyment and creativity! 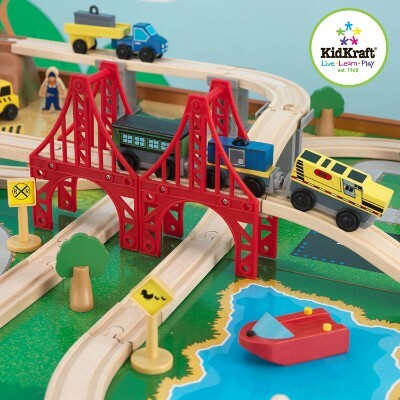 The train passing through and around the Metropolis Train Table by KidKraft is a reflection of modern-day urban railway systems. City roads crisscross with railroad tracks to provide an interplay between other land-based vehicles and trains. There’s an airport, a helipad, bridge, homes, cars, riverboat, police station, and many more. 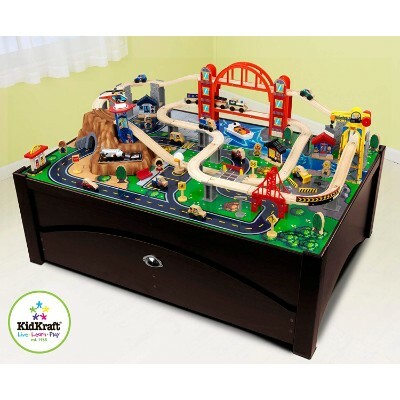 If you’re in the market for a high quality and sturdy train table, then look for further than this Metropolis Train Table by KidKraft. It’s a great sized toy that can fit into most rooms without completely taking over the space. The flip side also has a dark wood finish that makes it a great design feature as well. The suspension bridge itself is designed as a two-tier system to accommodate both road and rail traffic. A mountain tunnel adds a natural element to the metropolitan landscape. The Metropolis is constructed of solid wood and comes with a rolling trundle, allowing for superb storage of the 100 play set pieces. The large storage compartment plus the solid wood construction make the Metropolis truly one of a kind. Unfortunately, because of this, it may be a bit pricier than most. Regardless, with all these wonderful pieces mimicking a modern city, we’d say it’s worth every penny. Magnets can weaken over time. There’s an airport, a helipad, and a hospital complete with an ambulance service. 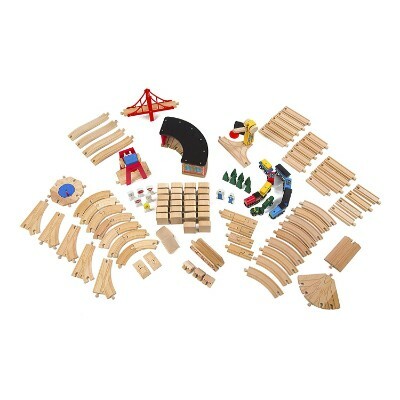 There are other pieces that make the Ride Around a play set that is just perfect for beginning young train engineers. There is a suspension bridge, barn house, and even a fully working crane to complete the 100-piece set. What’s fantastic about this KidKraft creation is that it comes with 2 storage bins, allowing kids to organize and store the different components of the set. As a table that is sturdy enough to hold your child, it's sturdy enough for your child rough and tumbles play. Though there are little pieces that should be removed if your child is younger to avoid any choking hazards. if kids already have the wooden versions of Thomas & Friends or even Brio, they’d be able to use these too on the train table. Your child can also choose to place the tracks on the floors for further ways to play with this versatile set. The addition of storage bins help eliminate the need for purchasing a separate toy box for the components of the play set. The 100 pieces included in the table is also remarkable especially for beginners. Made from solid beechwood, this fifteen piece set is a lovely addition to any train enthusiast’s collection. 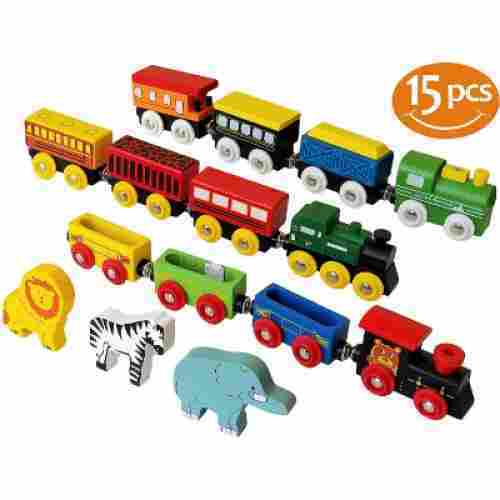 The twelve magnetic cars and three bonus animals are compatible with all major railroad sets, including Thomas Railway System, Brio, Melissa & Doug, Imaginarium, Kidcraft, Conductor Carl, Chuggington Railway, Maxim Wood, and Die Cast Gordon trains. Help your child explore and learn about shapes, colors, animals, pattern recognition, and coordination. Train sets and tracks help your child build and explore as they fine-tune their motor skills throughout early development. The set is non-toxic, free from BPA and phthalates, and tested by third-party labs to ensure safety and quality. The three little animals connect magnetically into their carts so that they won’t tip over, jiggle, or fall out. Strong magnets connect the cars to each other, allowing you to make your train as long or short as you please. It can be frustrating to spend money on expensive name brand items when you know your toddler is just going to chew them up and throw them about. This is a wonderful alternative as it is universal and compatible with expensive tracks and sets, while still being durable and affordable. It may not be readily evident but you can look at these playsets as oversized LEGO blocks that children will need to piece together to form a continuous loop around a central "village" or structure. You can see that kids will have to use their power of logic to place different sizes and shapes of tracks to produce a mini railway system for the locomotive to run on. They will ask themselves where to put the mountain, the forest, the bridge, or even the train depot and station. These are questions that require some answers. And this is the very essence of problem-solving. Most train tables come in a standard rectangular form, although it is not unusual to see other shapes like squares and circles. Some are even rectangles. It is not really the shape that matters but what is already included in the furniture. Most come with printed landscapes to help kickstart the mini railroad-building project. Some also include starter sets that include toy trains and accessories like tracks, buildings, bridges, train stations and depots, among others. If you already have these things then you might want to just go for a simple design. If not, you may want to go with a product that already includes a starter set. Many come with specific themes, too. It can be a favorite kiddie train TV show, mountain scenery, or even the wild West. 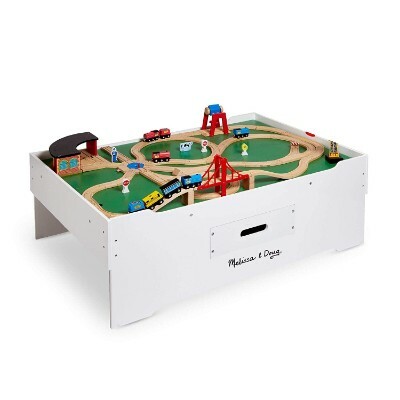 Some also come with lids that can be used not only to cover the train table but also as an additional surface for children’s activities like drawing, doodling, painting, and even solving some puzzles and building some craft toys. There are also those that have integrated storage compartments which is simply perfect for organizing the different elements of the playset. We have already said that there are plenty of train table manufacturers out there. Most of those that produce high-quality ones come from North America and Europe, although it’s not uncommon to find exceptional ones from Asia and other parts of the globe. However, it is really best to go for a brand that is well-recognized in the design and manufacture of high-quality train tables rather than risk getting one from a company with no known reputation for such things. For starters, you can always trust Step2, KidKraft, Fisher-Price, and Imaginarium to provide you with great kiddie play furniture. It is a well-established fact that young kids love playing with toy trains. With Thomas the Tank Engine and other kid-friendly train characters, toddlers and preschoolers can whip up their imagination riding and driving one of these famous vehicles. Now, what’s a toy train set if there is no landscape for it to run through and around? That is why getting a train table is a must. Here are some benefits of train tables. Without a doubt, piecing the different train set components requires exceptional mastery of psychomotor skills. Kids’ fine-motor skills must be well-developed so they can place even the smallest elements into their correct places. More importantly, children will require their spatial motor coordination so they can accurately place such pieces within a tiny space. Playing with train sets will help enhance the development of these psychomotor skills. Without question, you should always go for products with quality construction and design. Most train tables are made of wood so you can always look at it as a piece of furniture. As much as possible you should go for solid wood as these provide exceptional strength and durability which means you and your kid will be enjoying your platform for many years. The only downside to solid wood construction is that it tends to be priced a bit higher than other types. You can also choose those that are made of fiberboards, particle boards, or even plywood. Their main draw is that they cost a fraction of the price of a solid wood, particularly a hardwood. Another thing going for these engineered wood products is that they are rigorously tested for strength and durability which meets both national and international product requirements. There are also some manufacturers that incorporate a mixture of plastic and metal in their wooden designs. Children playing with train sets will have to use their imaginations in coming up with unique designs and layouts for their playsets. This is where some parents are quite apprehensive about playsets that already have built-in layouts. Instead of encouraging children to come up with their own unique railway design, all they have to do in such cases is to follow the suggested layout. In situations where the train table allows for some input from your kid, you can expect your child to come up with really crazy ideas about how to place the different pieces together. In fact, it is not uncommon to see elements of a roller coaster in the set up since this is viewed by kids to be really fun. Like all playsets and kiddie stuff, safety is a paramount concern. Here are some safety tips for kids and train tables that you may have to observe so your child can make the most out of his or her play time. Make sure that the train table is placed in a room that has ample space to move about. If you place it in an area where your child can barely move around the platform, there is a tendency your kid will be bumping into things. If you can secure a minimum of 3 or 4 feet on all sides of the train table, that would be great. Otherwise, if it simply is too large for the room, maybe you need to relocate it to a bigger area or buy a smaller table. Choose train tables that have rounded or smooth, tapered edges rather than sharp ones. If you happen to purchase furniture with an unusually sharp edge, you can cover this with a cloth or even a foam material. It would be better if you can sand it off, however. Even if your kid has wooden toy trains instead of electronic versions, it is important to keep it clean always. For wooden blocks, you can clean them using a damp cloth that has been dipped in a solution of water and soap. Alternatively, you can use cleansing wipes to sanitize the wooden pieces before storage. For electronic versions, you may need to ensure electrical safety at all times. Make sure the batteries and chargers are all UL-certified. You don’t want to start fires in your home because of a defective battery and charging system. If you see any piece or component of your train table or toy trains that are already damaged or broken, make sure to apply an immediate fix. This is especially true for wooden pieces as splinters can cause cuts among children. If it can no longer be repaired or fixed, sometimes it makes more sense to discard it and replace it with a new one rather than risk injuring your kid. Teach your kid to take care of his or her train playset. It is also important that they know how to pick up their toys and to store them in their respective places. This helps keep his or her play room generally clean and tidy, minimizing if not eliminating the risk of falls and resulting injuries. Providing your kids with toy boxes or compartments should come in very handy. Building play train sets can be a lot of fun. If you have to choose the right train table for your child, make sure to consider the quality craftsmanship, its size and design, and the reputation of the manufacturer. Only by doing so can you ensure that your child will be able to further hone his or her problem-solving skills, imaginative and creative abilities, and psychomotor development. Additionally, like all playthings and stuff that kids use and play with, it is equally important to keep these train tables in pristine condition so they will be safe to play on. And with the 10 best train tables we’ve shared, you can now start embarking on a wonderful journey of train management with your kid. q: Which sets offer the most track variations? It’s always more fun for everyone when the tracks can be configured into more than just a straight line. Thankfully, many of these sets offer track pieces that can be manipulated into endless varieties of routes and directions, including curves, complete loops and track switches. 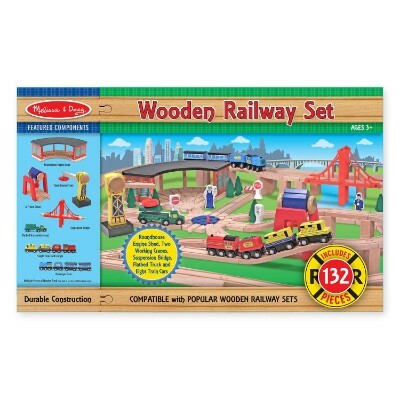 Some great sets that offer this ability include the Melissa & Doug Deluxe Wooden Railway Train Set, and the Conductor Carl 100-piece Wooden Train Track Set. q: Why are some of them in $90-$100 or higher price range? The price range depends on the quality of the products and materials that are used in its construction. The material that is used in the making of the product can be very expensive if it is being shipped from overseas. There are some physical toy stores located around the country in which you can typically find the same product for a lesser price. q: Why does this list feature multiple items from the same manufacturer? For the purpose of this research, we researched extensively to find the top products and brands. Some of these products have the same brand because that specific brand is highly regarded in the train table industry. Therefore their products are well-liked all around. q: How can I be sure of the quality of the product I am purchasing? All the products on our list have been confirmed regarding their quality. However, to be extra sure, you can check out the product reviews on Amazon and other retailer sites. You can also find out the quality of the product by visiting local stores where the product is available and seeing how the product's quality is before you make a purchase. q: All the products on our list have been confirmed regarding their quality. However, to be extra sure, you can check out the product reviews on Amazon and other retailer sites. You can also find out the quality of the product by visiting local stores where the product is available and seeing how the product's quality is before you make a purchase. As we mentioned in the Criteria portion, not each product is built the same. So, just as a heads up for you while you make your decision, we included the compatibility. Knowing this will allow you to know which other branded products will work with that specific product. 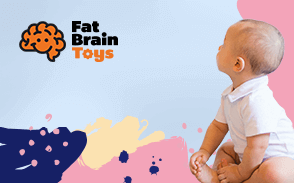 q: Are these toys beneficial for my child? Yes, these table sets are great for encouraging your child for imaginative play. It’s also great for building their hand-to-eye coordination and fine-motor skills.